This top quality joint supplement contains high concentrations of Glucosamine and Chondroitin and is thought to be one of the most bioavailable joint supplements on the market today. It is perfect to use before the competition season starts to keep the joints supple or it can help maintain joint mobility and provide comfort for horses with joint lesions. Two formulations are available: one contains Harpagophytum (Harpa - Devil's Claw) and the other is free from it. For horses needing articular support by reinforcing protection of the cartilage. For horses in training or with any change of work load. Preparation for FEI competitions, notably for performance horses at the beginning of the season. After a surgical intervention, when the horse resumes training. 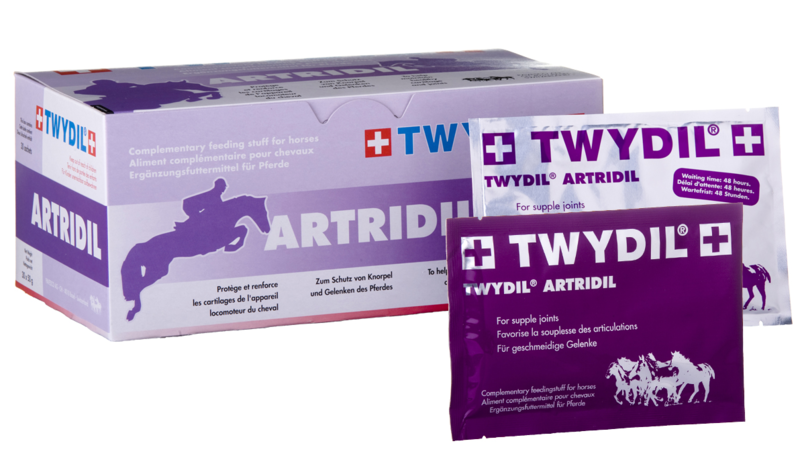 For competition horses, we recommend using the "Twydil Artidil without Harpa" as Harpagophytum is a controlled substance. Give one sachet daily orally for a minimum of 30 days. For maximal effect, 2 sachets can be given orally 3 - 5 days prior to high intensity exercise or events. Trade form: 50g sachets of powder in boxes of 30 or 90 sachets. Contains high concentrations of the naturally occurring substances Glucosamine hydrochloride, Chondroitin, and Harpagophytum (in Harpa only) plus the trace elements Copper (1600mg), Manganese (3200mg), Zinc (6400mg) and Magnesium in chelated form.